Simmons Paving Company Ltd., Dartmouth, Nova Scotia – 902-434-6212 – Residential & Commercial Asphalt Paving Company with proven expertise in Halifax, Dartmouth and surrounding areas for over 40 years. Quality materials and products, honest competitive pricing and an excellent reputation throughout the residential & commercial paving industry. Pavement services include striping for an existing roadway, sealcoating to smooth a rough surface and full construction for a new roads and parking lots. Need Help With A Paving Project? Through continued innovation, asphalt provides a reliable and durable weather resistant surface available in no other medium, fulfilling the needs of both large and small projects. Asphalt is a flexible surface that is more likely to accept shifting due to weather extremes and can resist cracking commonly associated with other paving systems. Asphalt driveways can remain in great shape for decades. The right base and proper asphalt sealers are the keys. ASD Asphalt Driveway Sealer is specially designed for residential asphalt driveways. A quality hot mix asphalt driveway that is both functional and aesthetically pleasing can be built at a reasonable price .... To protect your investment, we encourage you to research - Asphalt Maintenance, and Asphalt Driveway Maintenance. 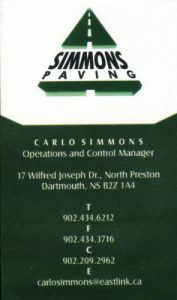 Simmons Paving Company Ltd. has proven its expertise in Halifax, Dartmouth and surrounding areas for over 40 years. Carlo Simmons, and his team of dedicated professionals are proud to offer quality materials and products, honest competitive pricing and an excellent reputation throughout the commercial paving industry. Whether you need striping for an existing roadway, sealcoating to smooth a rough surface or full construction for a new road or a parking lot, our pavement services are durable and versatile. At Simmons Paving Company Ltd. we understand how important it is to get the job done – on time, and within your budget! That’s why Simmons Paving Company Ltd. offers customers in Halifax, Dartmouth and surrounding areas a commitment to providing quality service with a spirit of excellence. Why Choose Simmons Paving ? We provide surface construction services for large & small projects – minor repair to new construction. We are equipped with top-notch equipment. We have proven our expertise for over 40 years. No project is too big ….